Conimex Mix for Nasi Goreng - Conimex - The Dutch Shop LLC your store for Dutch groceries. Nasi Goreng, which literally means fried rice, is the most well-known dish of the Indonesian cuisine. 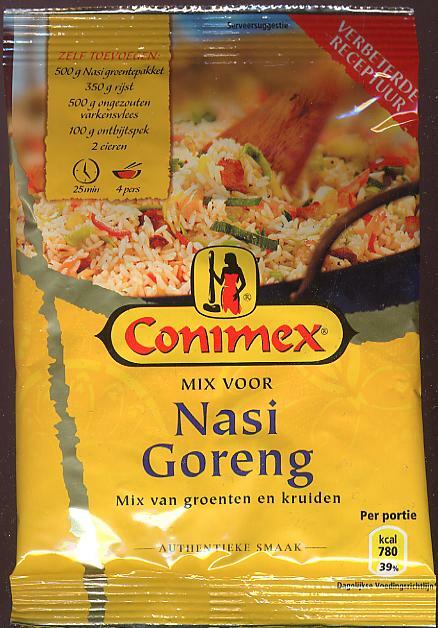 This mix contains carefully selected vegetables and spices to make the most delicious nasi. Ingredients: salt, onion, paprika, carrot, leek, vegetable bouillon flavor, coriander seed, green beans, garlic, vegetable oil(contains sesame) vegetable fat, yeast extract, curry, (coriander, turmeric, fennel seed, cumin seed, black pepper, fenugreek, cayenne, cardamom, mustard seed), cumin, malto-dextrin, white pepper, potato starch, cayenne, ginger, soy sauce (soybean, wheat), sugar, prawn powder, beet root extract, lemon juice powder. Contains: gluten, crustaceans, soy products, sesame seeds, mustard. 14 oz. / 400g of diced unsalted pork or chicken breast.